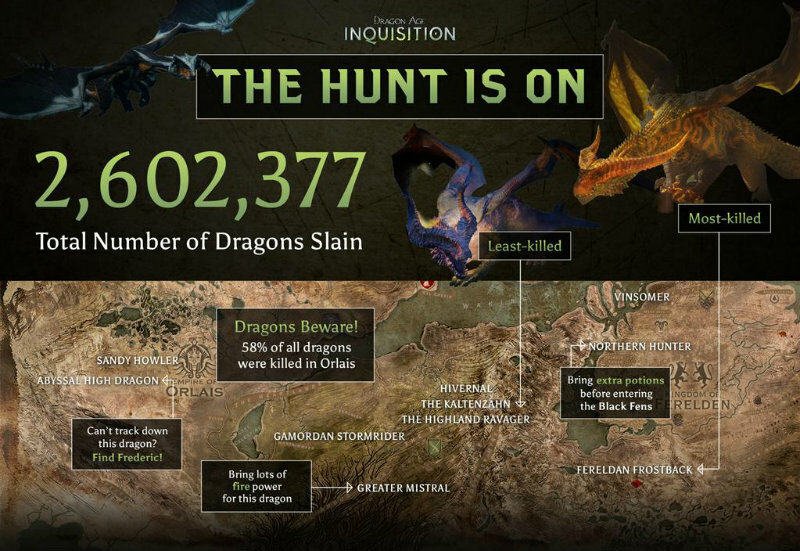 How many dragons killed in Dragon Age: Inquisition? Hunting down and killing all the dragons in Dragon Age: Inquisition was seriously fun when I played over the holidays. Yes, I killed every Dragon, contributing to these delicious stats released on twitter. It makes sense that the most killed dragon is the Fereldan Frostback – he’s relatively low level and easy enough to take out once you’re of a high enough level. Of course, depending on who you take into battle with you, you might need to equip some items with fire resistance. Some people are struggling to even find the Abyssal High Dragon; sorry, you’ve got to do some fetch quests for Frederic first. Ferelden Frostback (Level 12) Hinterlands – Resists Fire and is weak against Cold. I highly recommend taking him on with two mages with plenty of ice magic. He will also fly around a lot and add a whole bunch of enemies to the battle, so Iron Bull can be a good choice with his War Cry. Northern Hunter (Level 13) Crestwood – Resists Electricity and weak vs Spirit. The Northern Hunter is a pain because of his electrical charges that cause your characters damage if they’re close to each other. Use tactical camera or manually move your party around the battle field to keep them spread out. The Abyssal High Dragon (Level 14) The Western Approach – You will need to complete Frederic’s quests to find out more about dragons before this beast will appear. Another fire dragon, he is weak to cold. Again, I’d recommend going in with two mages speed with plenty of ice abilities. Gamoran Stormrider (Level 15) The Exalted Plains – Resist Electricy and weak to spirit. By this point in the game, you probably have your mages specialized. I found having a Knight-Enchanter in the party (Vivienne or the Inquisitor depending on your play through class) made a huge difference – they can keep barriers up and deal some big damage to the dragon’s barrier while dealing spirit damage. Greater Mistral (Level 17) Emerald Graves – Turning things on its head, this dragon resists cold and is vulnerable to fire. However, the same basic strategy applies, although by this point you can also craft weapons with some hefty fire damage attached if you so wish. Hivernal (Level 19) Emprise du Lion – Also resisting cold and weak to fire, I ended up taking out this Dragon with Cassandra and Vivienne. Cassandra’s shields made her practically invincible as she kept the dragon focused on her so that everyone else could chip away at its health. Vinsomer (Level 19) The Storm Coast – Only found after moving plot forward, this dragon resists electricity and is weak vs spirit. I gave Iron Bull an ability that dealt spirit damage within a fairly side radius, making this dragon slightly easier. Sandy Howler (Level 20) The Hissing Wastes – Resisting Fire and weak vs cold, the strategy for this dragon should be established for players by now. Just ensure that you’ve leveled up enough, have upgraded your potions and crafted some quality gear by this point. Kaltenzahn (Level 21) Emprise du Lion – Resisting cold and weak vs fire, this second dragon of Emprise du Lion gives enough XP to making killing it worthwhile. Hopefully by now you have collected enough shards to unlock a bunch of doors in the temple – be sure to do so before battle and get some cold resistance of your own. Highland Ravager (Level 23) Emprise du Lion – The toughest dragon in the open world, this one resists fire and is weak to cold. Again, I highly recommend using the shards to boost your own elemental resistance as well as crafting some masterwork armor and/or weapons. Of course, if you’re at this point you’ve probably killed the other dragons and gotten some quality loot, which will help you in this. I hope this helps you contribute to the stats on dragons killed. Have you already taken any out? I love how terrifying and epic those battles feel.